1 can i know for sure if i have a relationship with god? 2 I John 1:5-7 This is the message we have heard from him and declare to you: God is light; in him there is no darkness at all. If we claim to have fellowship with him yet walk in the darkness, we lie and do not live by the truth. 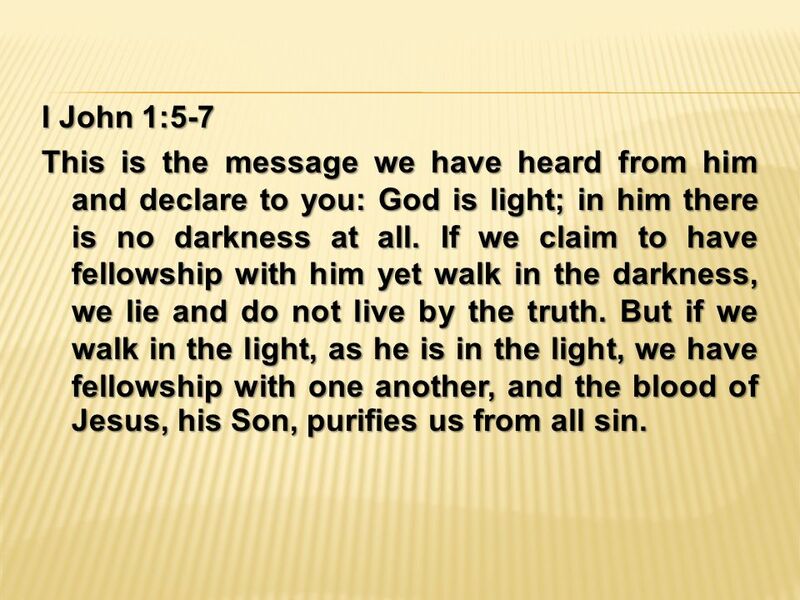 But if we walk in the light, as he is in the light, we have fellowship with one another, and the blood of Jesus, his Son, purifies us from all sin. 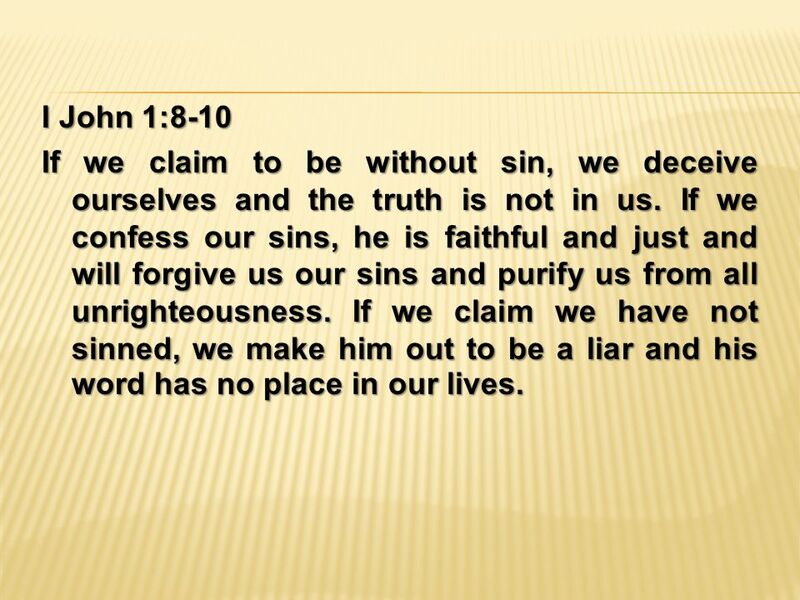 3 I John 1:8-10 If we claim to be without sin, we deceive ourselves and the truth is not in us. If we confess our sins, he is faithful and just and will forgive us our sins and purify us from all unrighteousness. If we claim we have not sinned, we make him out to be a liar and his word has no place in our lives. 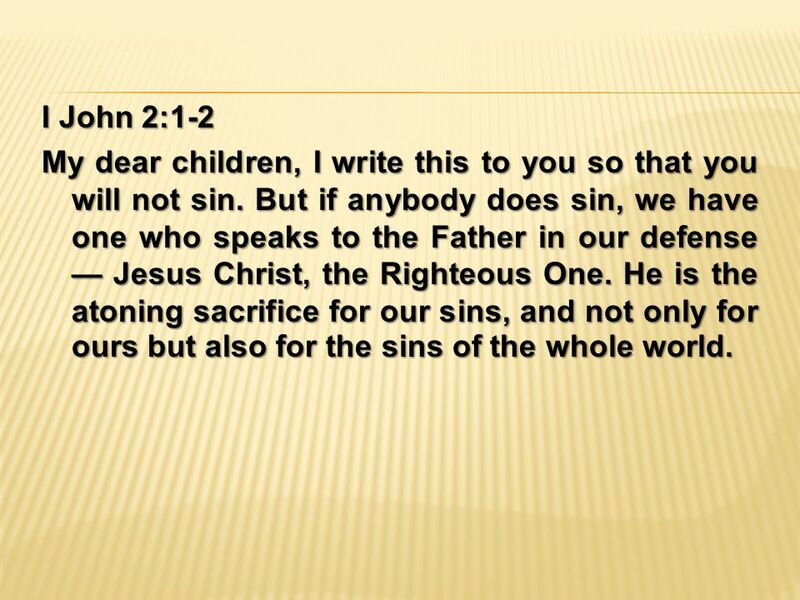 4 I John 2:1-2 My dear children, I write this to you so that you will not sin. But if anybody does sin, we have one who speaks to the Father in our defense — Jesus Christ, the Righteous One. He is the atoning sacrifice for our sins, and not only for ours but also for the sins of the whole world. 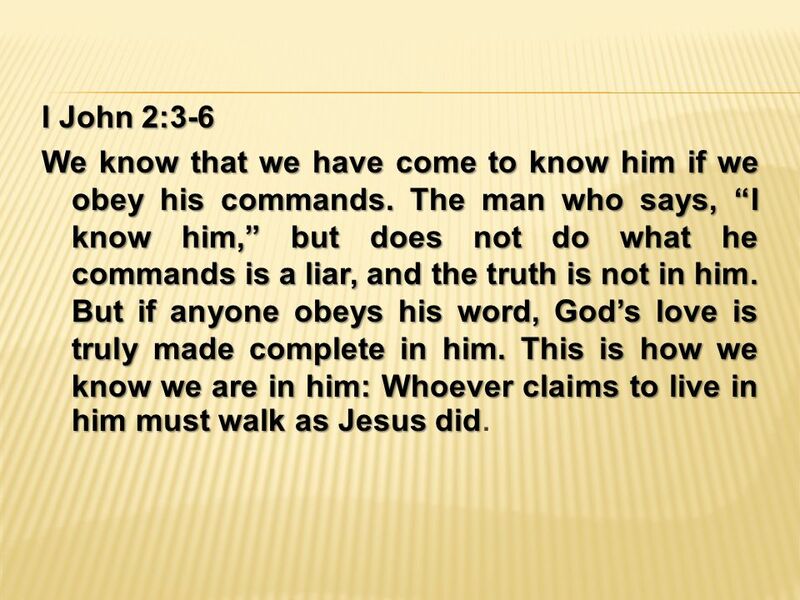 5 I John 2:3-6 We know that we have come to know him if we obey his commands. The man who says, “I know him,” but does not do what he commands is a liar, and the truth is not in him. 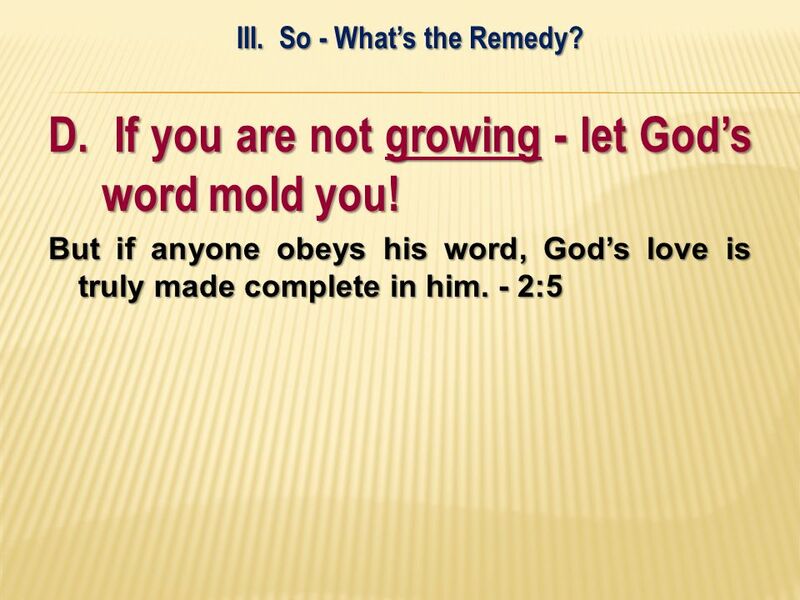 But if anyone obeys his word, God’s love is truly made complete in him. This is how we know we are in him: Whoever claims to live in him must walk as Jesus did. 6 I. What is Divine Fellowship Anyway? 7 I. What is Divine Fellowship Anyway? A. It’s fellowship with the Father & with the Son. We proclaim to you what we have seen and heard, so that you also may have fellowship with us. And our fellowship is with the Father and with his Son, Jesus Christ.- 1:3. 8 I. What is Divine Fellowship Anyway? A. It’s fellowship with the Father & with the Son. We proclaim to you what we have seen and heard, so that you also may have fellowship with us. And our fellowship is with the Father and with his Son, Jesus Christ. - 1:3. 1. 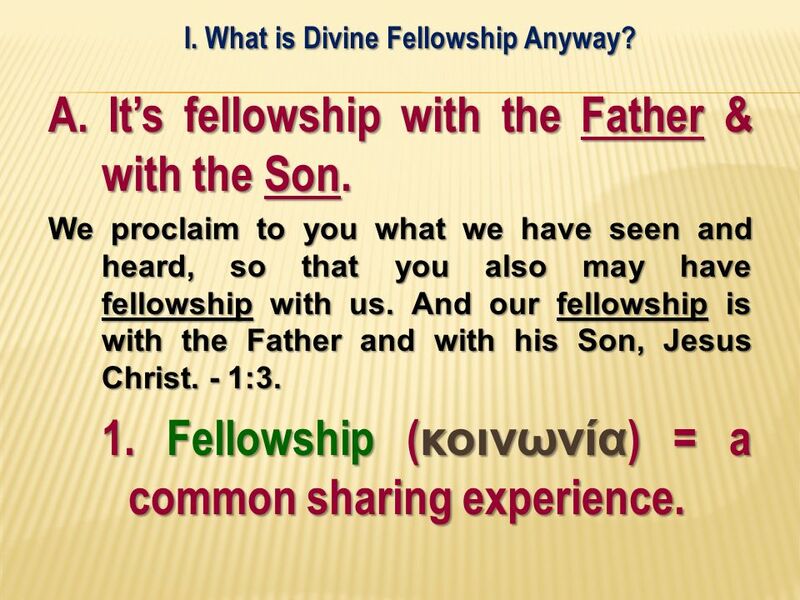 Fellowship (κοινωνία) = a common sharing experience. 9 I. What is Divine Fellowship Anyway? 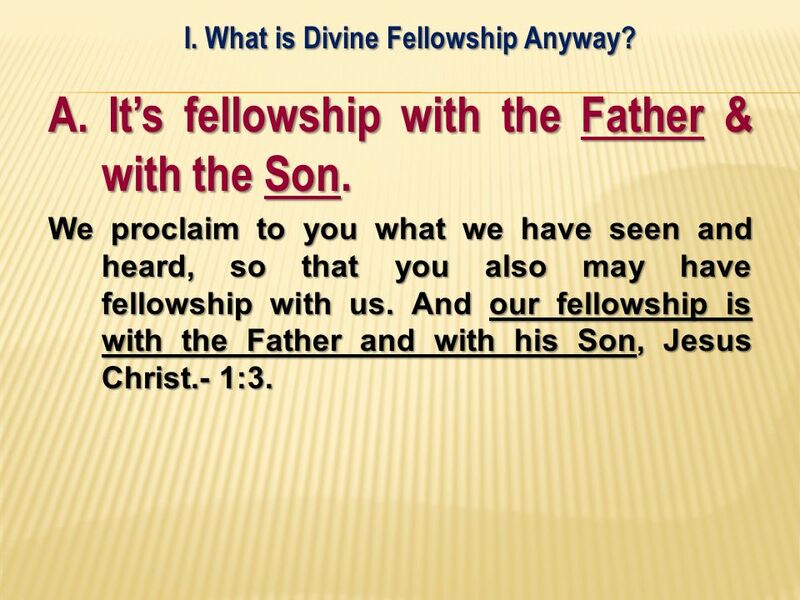 A. It’s fellowship with the Father & with the Son. 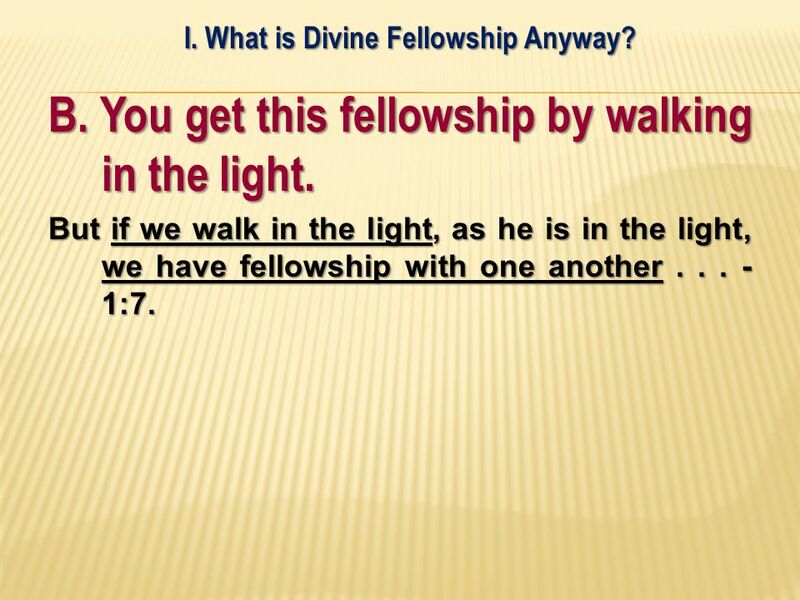 But if we walk in the light, as he is in the light, we have fellowship with one another :7. 2. When you have this fellowship with the Lord, you also have it with one another. 10 I. What is Divine Fellowship Anyway? B. 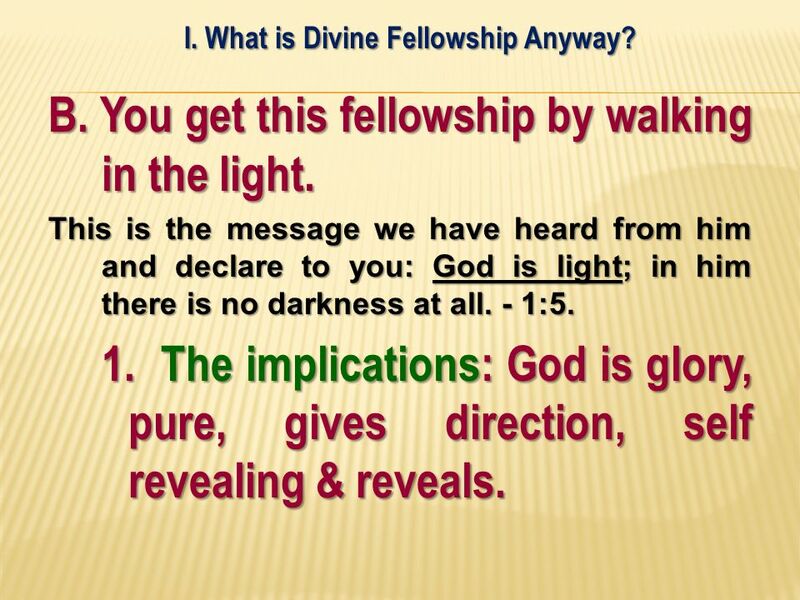 You get this fellowship by walking in the light. 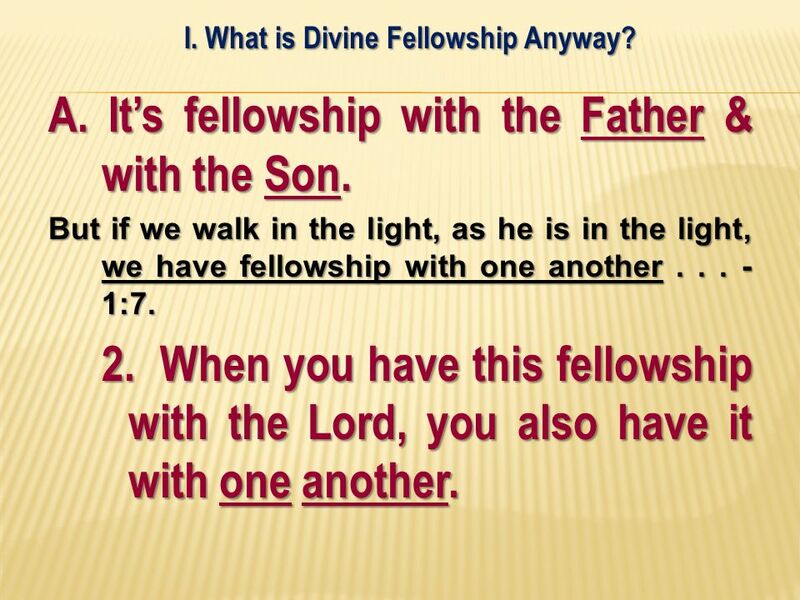 But if we walk in the light, as he is in the light, we have fellowship with one another :7. 11 I. What is Divine Fellowship Anyway? B. You get this fellowship by walking in the light. This is the message we have heard from him and declare to you: God is light; in him there is no darkness at all. - 1:5. 1. The implications: God is glory, pure, gives direction, self revealing & reveals. 12 I. What is Divine Fellowship Anyway? B. 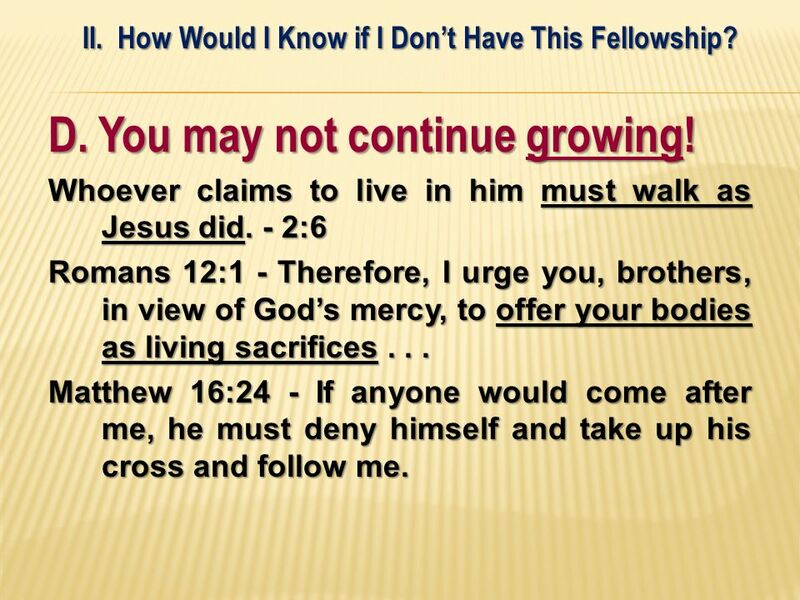 You get this fellowship by walking in the light. This is the message we have heard from him and declare to you: God is light; in him there is no darkness at all. - 1:5. 2. 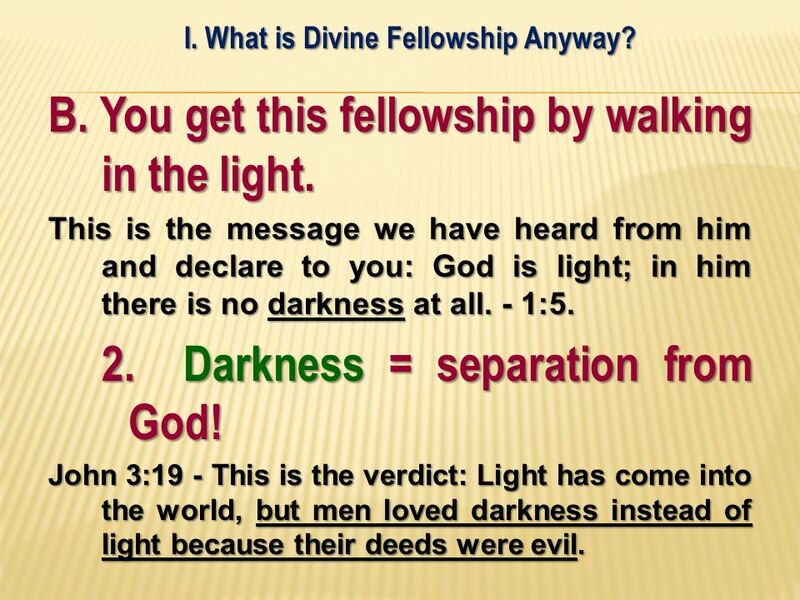 Darkness = separation from God! 13 I. 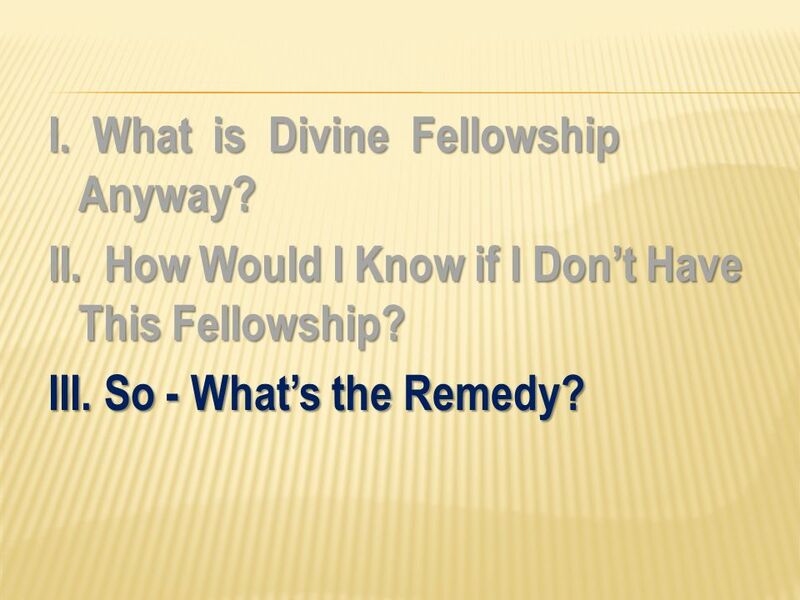 What is Divine Fellowship Anyway? B. 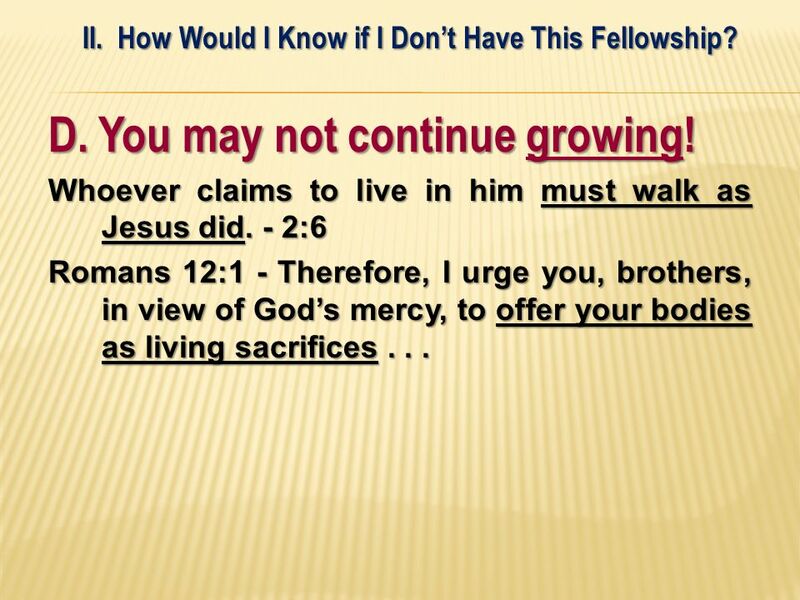 You get this fellowship by walking in the light. This is the message we have heard from him and declare to you: God is light; in him there is no darkness at all. - 1:5. 2. 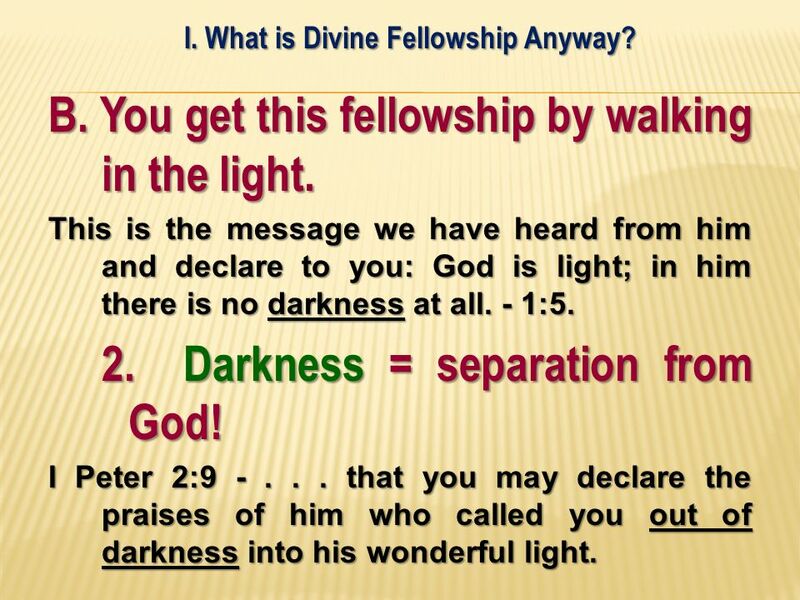 Darkness = separation from God! I Peter 2: that you may declare the praises of him who called you out of darkness into his wonderful light. 14 I. What is Divine Fellowship Anyway? B. You get this fellowship by walking in the light. This is the message we have heard from him and declare to you: God is light; in him there is no darkness at all. - 1:5. 2. 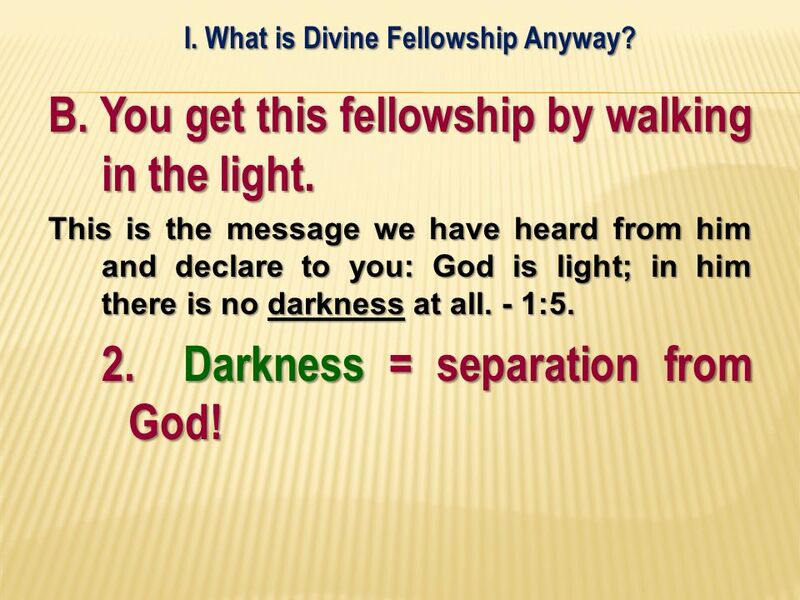 Darkness = separation from God! John 3:19 - This is the verdict: Light has come into the world, but men loved darkness instead of light because their deeds were evil. I. What is Divine Fellowship Anyway? II. How Would I Know if I Don’t Have This Fellowship? 16 II. How Would I Know if I Don’t Have This Fellowship? 17 II. How Would I Know if I Don’t Have This Fellowship? 18 II. How Would I Know if I Don’t Have This Fellowship? A. 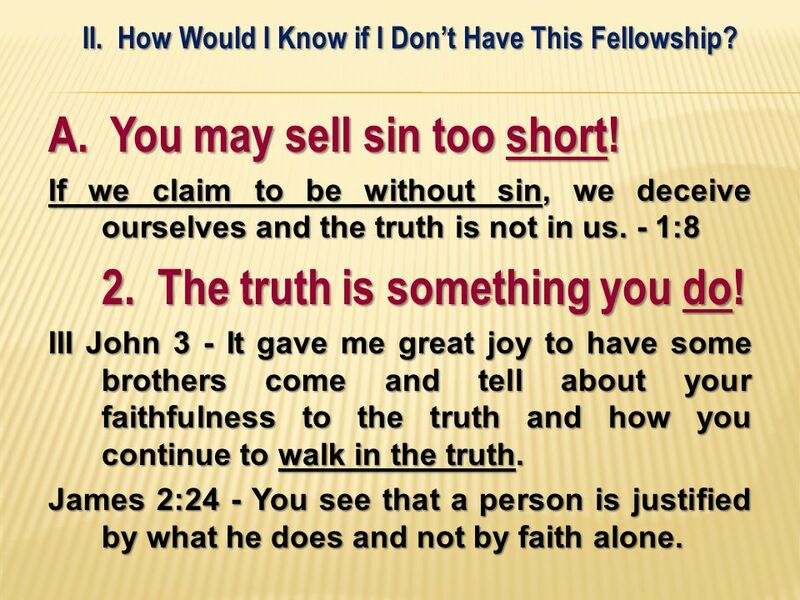 You may sell sin too short! If we claim to be without sin, we deceive ourselves and the truth is not in us. - 1:8 1. 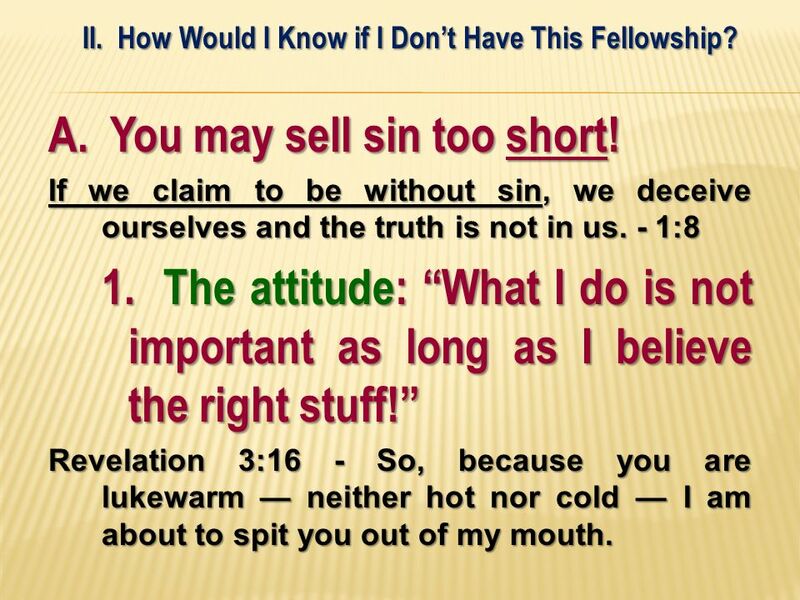 The attitude: “What I do is not important as long as I believe the right stuff!” Revelation 3:16 - So, because you are lukewarm — neither hot nor cold — I am about to spit you out of my mouth. 19 II. How Would I Know if I Don’t Have This Fellowship? A. 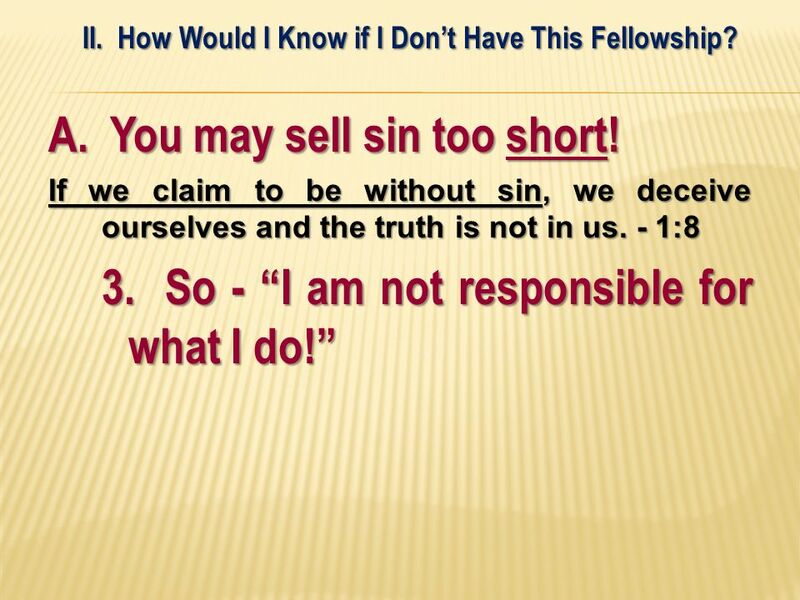 You may sell sin too short! If we claim to be without sin, we deceive ourselves and the truth is not in us. - 1:8 1. 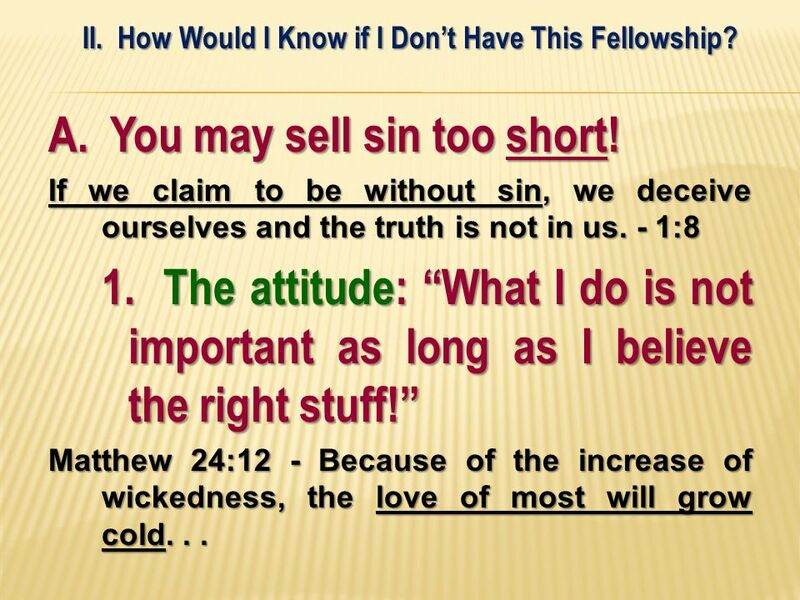 The attitude: “What I do is not important as long as I believe the right stuff!” Matthew 24:12 - Because of the increase of wickedness, the love of most will grow cold. . .
20 II. How Would I Know if I Don’t Have This Fellowship? A. 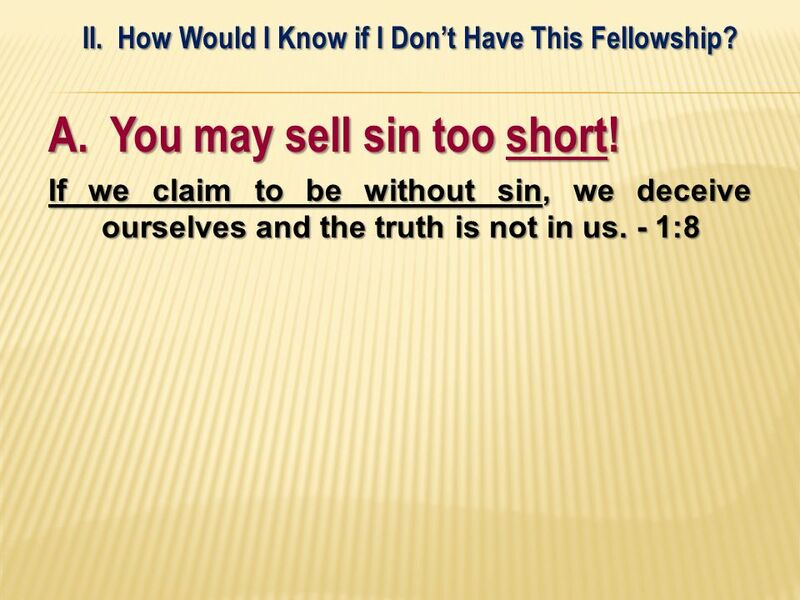 You may sell sin too short! If we claim to be without sin, we deceive ourselves and the truth is not in us. - 1:8 1. 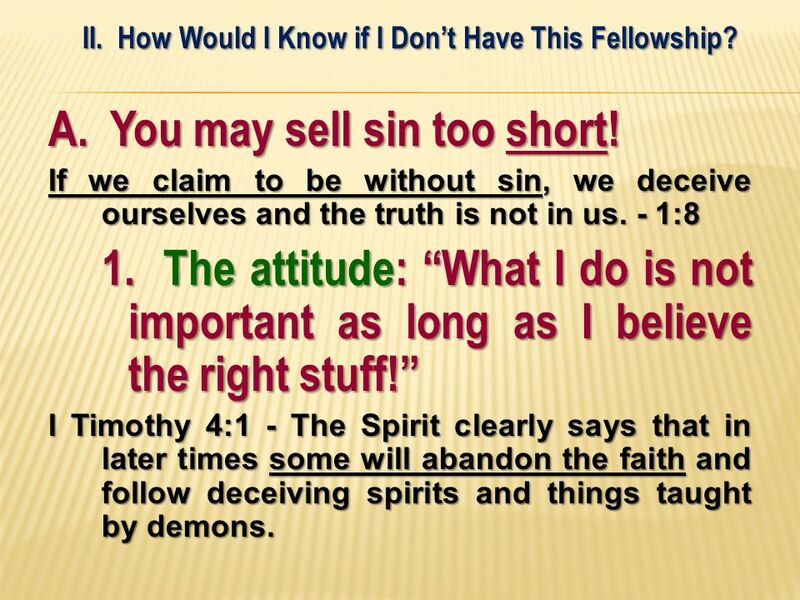 The attitude: “What I do is not important as long as I believe the right stuff!” I Timothy 4:1 - The Spirit clearly says that in later times some will abandon the faith and follow deceiving spirits and things taught by demons. 21 II. How Would I Know if I Don’t Have This Fellowship? A. 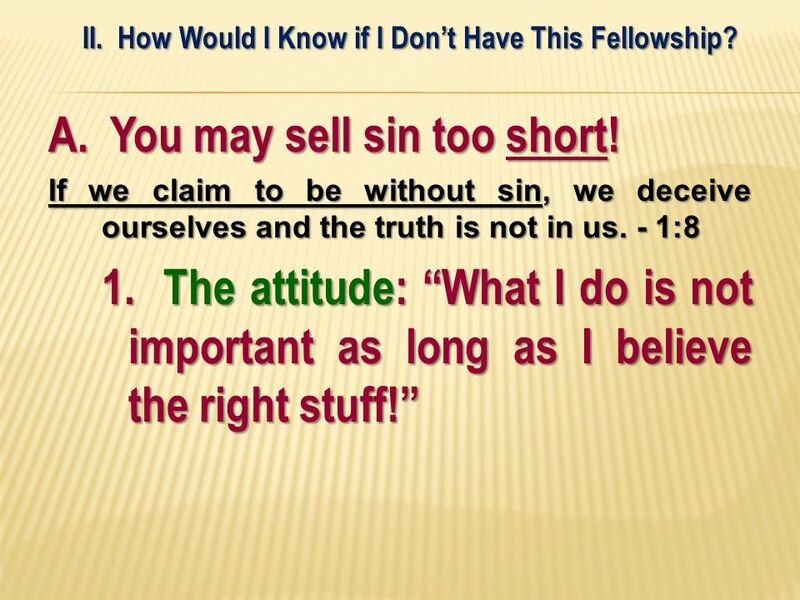 You may sell sin too short! If we claim to be without sin, we deceive ourselves and the truth is not in us. - 1:8 1. 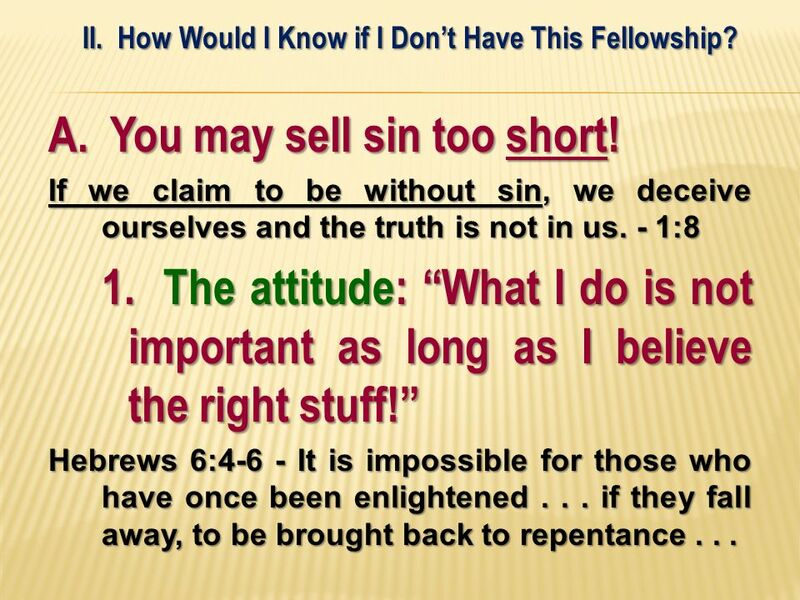 The attitude: “What I do is not important as long as I believe the right stuff!” Hebrews 6:4-6 - It is impossible for those who have once been enlightened if they fall away, to be brought back to repentance . . .
22 II. How Would I Know if I Don’t Have This Fellowship? A. 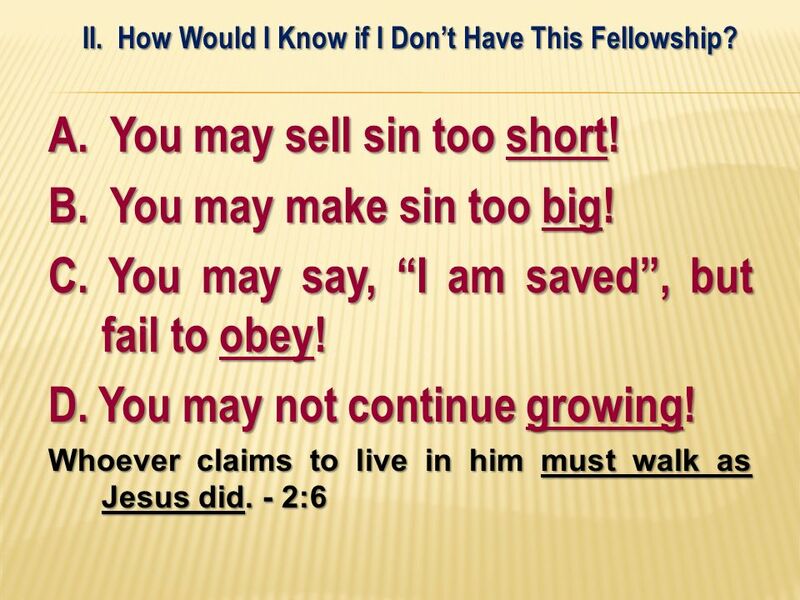 You may sell sin too short! If we claim to be without sin, we deceive ourselves and the truth is not in us. - 1:8 2. The truth is something you do! 23 II. How Would I Know if I Don’t Have This Fellowship? A. 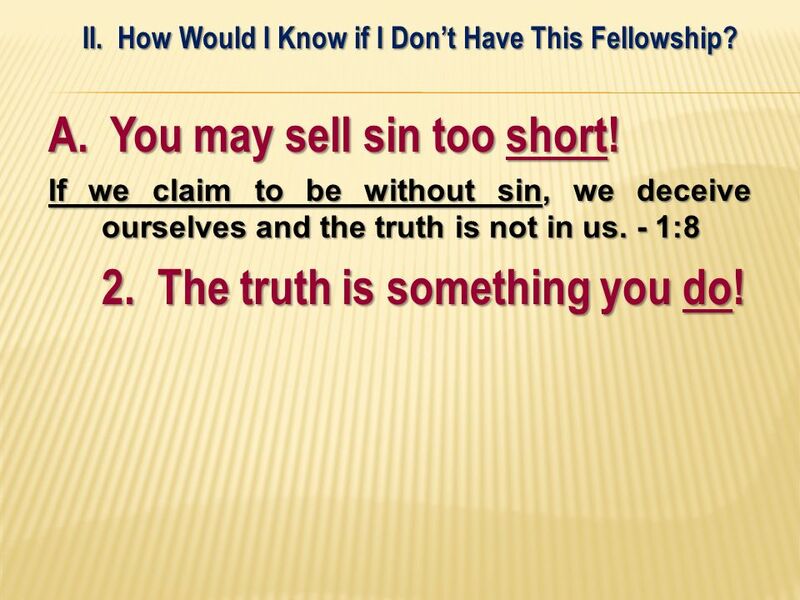 You may sell sin too short! If we claim to be without sin, we deceive ourselves and the truth is not in us. - 1:8 2. The truth is something you do! Romans 1:18 - The wrath of God is being revealed from heaven against all the godlessness and wickedness of men who suppress the truth by their wickedness . . .
24 II. How Would I Know if I Don’t Have This Fellowship? A. 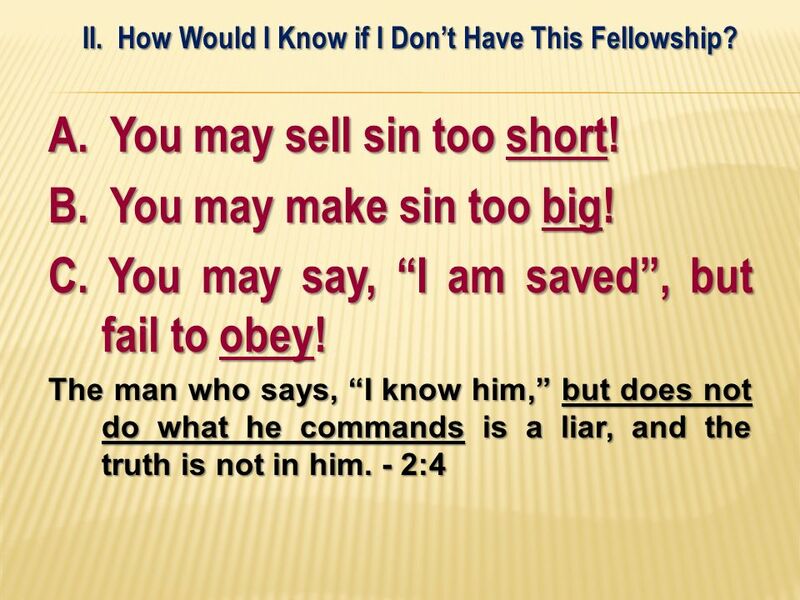 You may sell sin too short! If we claim to be without sin, we deceive ourselves and the truth is not in us. - 1:8 2. The truth is something you do! Romans 1:18 - The wrath of God is being revealed from heaven against all the godlessness and wickedness of men who suppress the truth by their wickedness . . . Galatians 5:7 - Who cut in on you and kept you from obeying the truth? 25 II. How Would I Know if I Don’t Have This Fellowship? A. 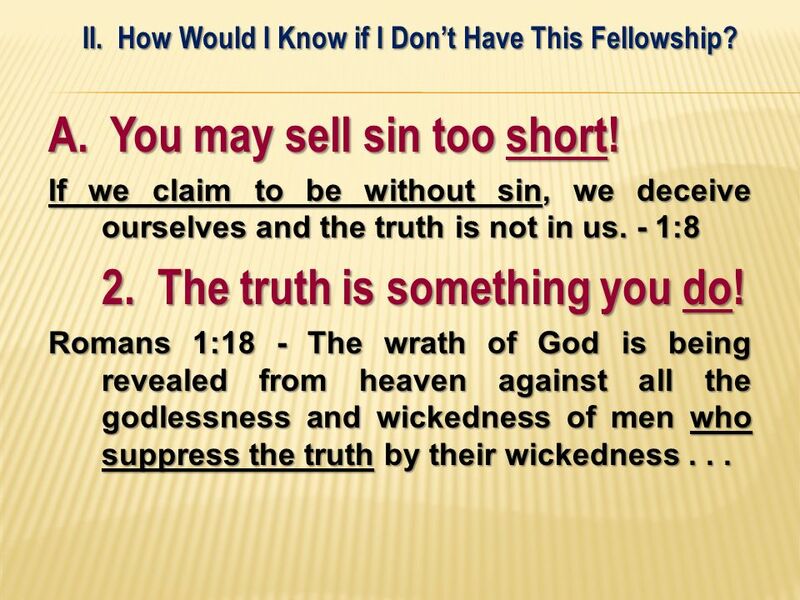 You may sell sin too short! If we claim to be without sin, we deceive ourselves and the truth is not in us. - 1:8 2. The truth is something you do! III John 3 - It gave me great joy to have some brothers come and tell about your faithfulness to the truth and how you continue to walk in the truth. 26 II. How Would I Know if I Don’t Have This Fellowship? A. 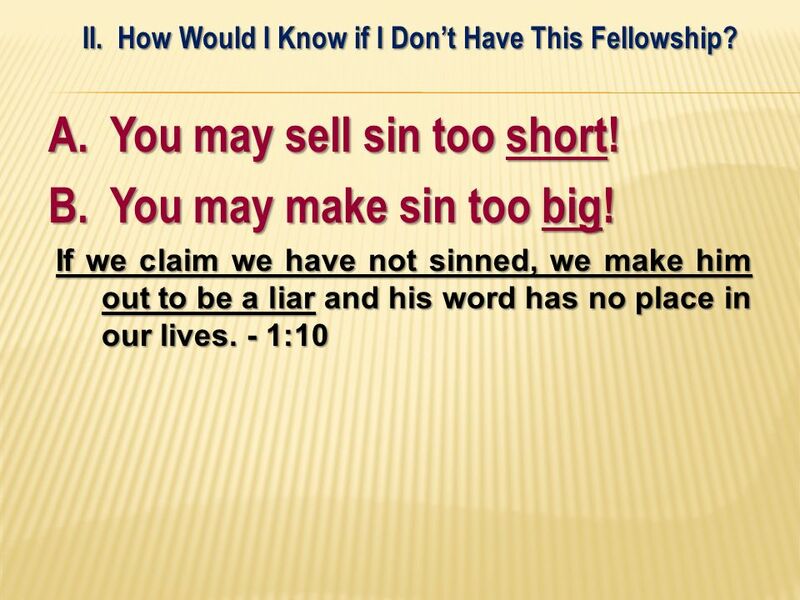 You may sell sin too short! 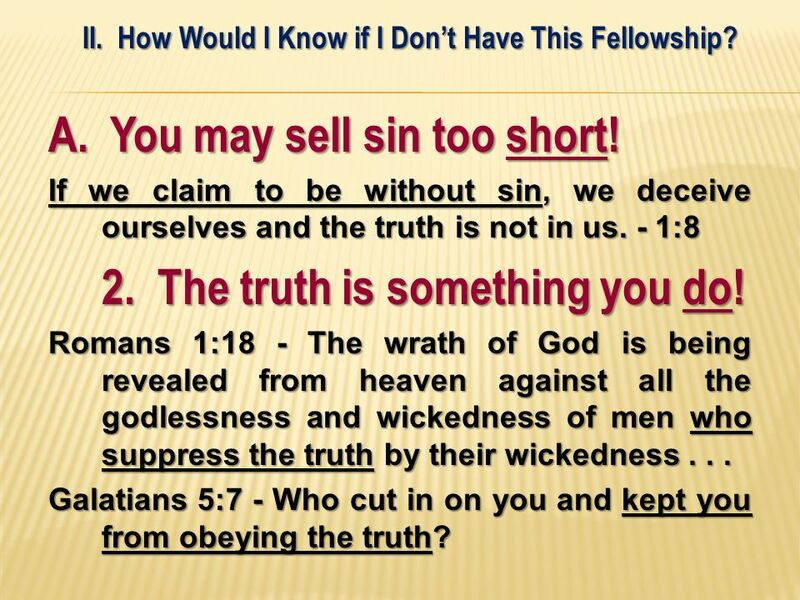 If we claim to be without sin, we deceive ourselves and the truth is not in us. - 1:8 2. The truth is something you do! III John 3 - It gave me great joy to have some brothers come and tell about your faithfulness to the truth and how you continue to walk in the truth. James 2:24 - You see that a person is justified by what he does and not by faith alone. 27 II. How Would I Know if I Don’t Have This Fellowship? 28 You are saved by grace - but there will be a judgment! II. How Would I Know if I Don’t Have This Fellowship? A. 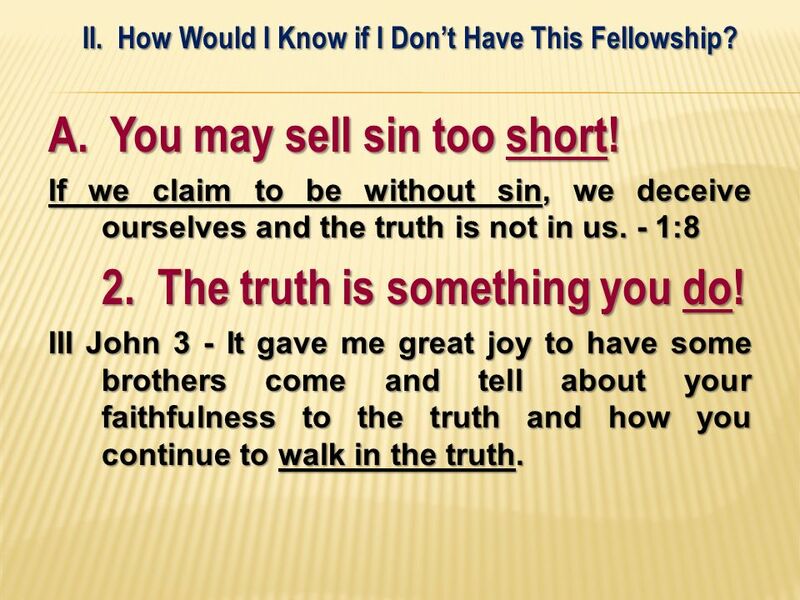 You may sell sin too short! If we claim to be without sin, we deceive ourselves and the truth is not in us. - 1:8 3. 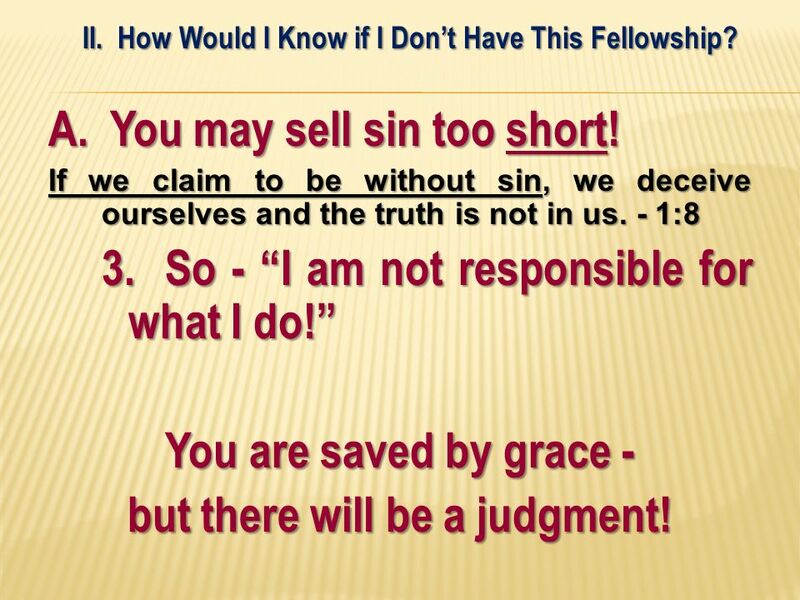 So - “I am not responsible for what I do!” You are saved by grace - but there will be a judgment! 29 II. How Would I Know if I Don’t Have This Fellowship? 30 II. How Would I Know if I Don’t Have This Fellowship? 31 II. How Would I Know if I Don’t Have This Fellowship? B. You may make sin too big! 2. 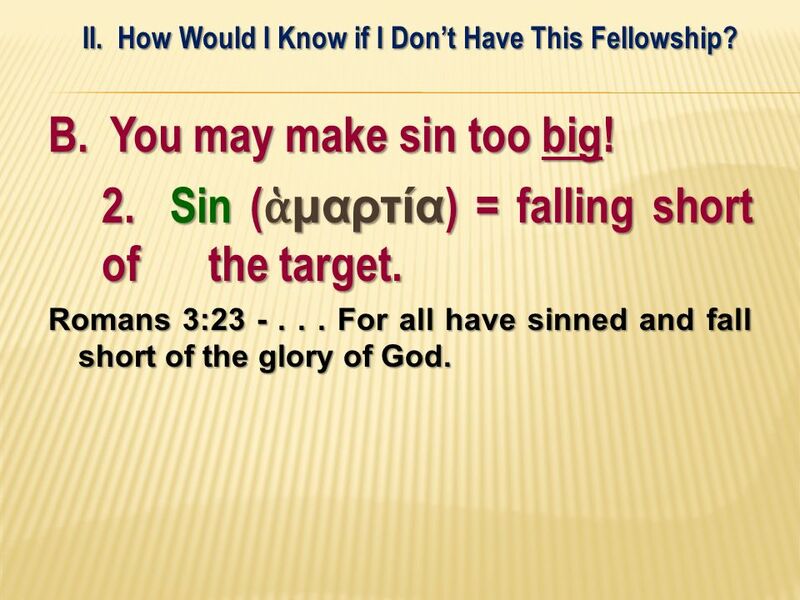 Sin (ἁμαρτία) = falling short of the target. 32 II. How Would I Know if I Don’t Have This Fellowship? B. You may make sin too big! 2. 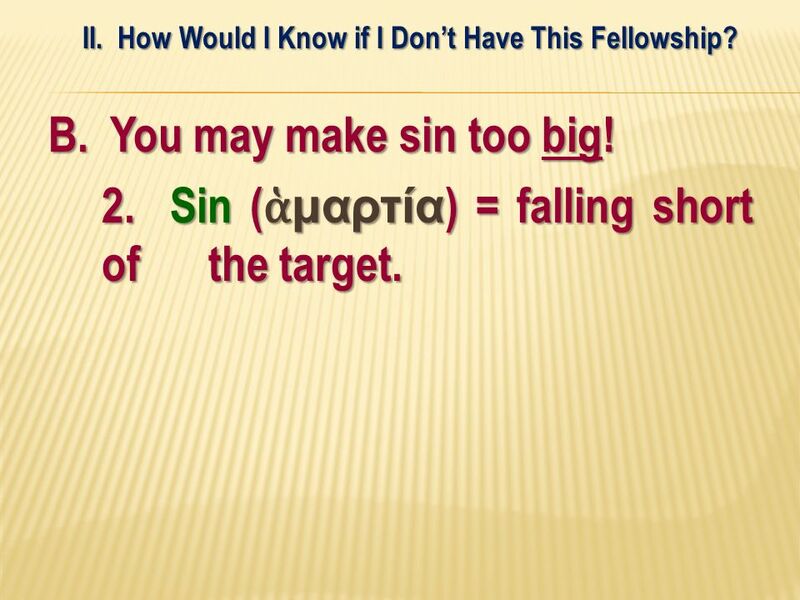 Sin (ἁμαρτία) = falling short of the target. Romans 3: For all have sinned and fall short of the glory of God. 33 II. How Would I Know if I Don’t Have This Fellowship? 34 II. How Would I Know if I Don’t Have This Fellowship? 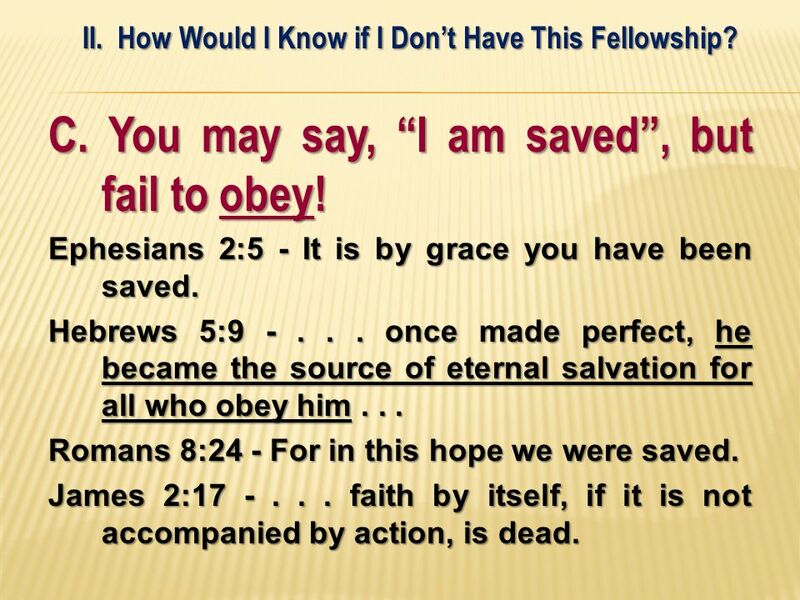 C. You may say, “I am saved”, but fail to obey! 1. The attitude: “All I have to do is have faith” or “All I have to do is be baptized”. 35 II. How Would I Know if I Don’t Have This Fellowship? 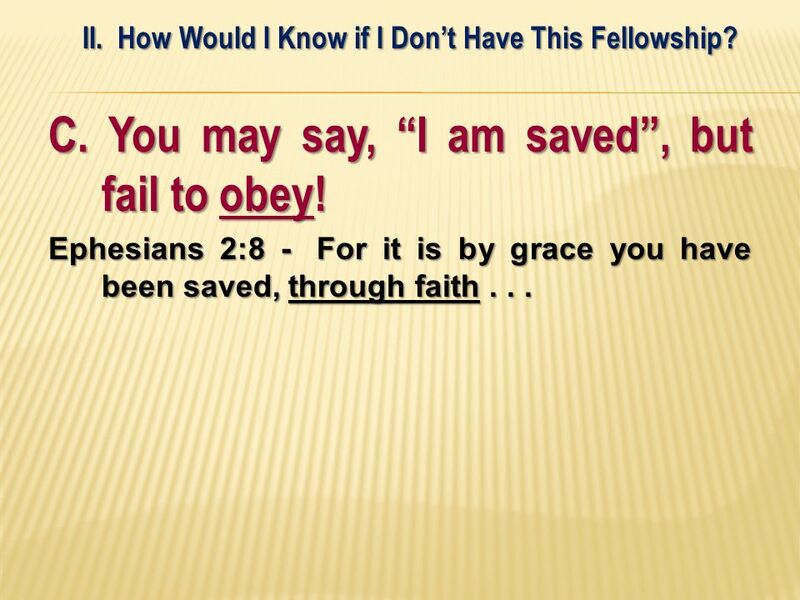 C. You may say, “I am saved”, but fail to obey! Ephesians 2:8 - ﻿ For it is by grace you have been saved, through faith . . .
36 II. How Would I Know if I Don’t Have This Fellowship? 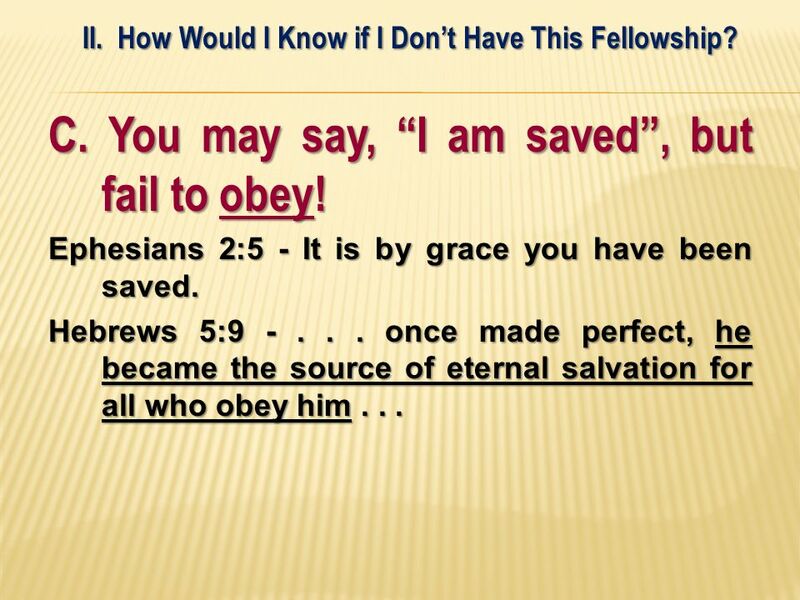 C. You may say, “I am saved”, but fail to obey! Ephesians 2:8 - ﻿ For it is by grace you have been saved, through faith . . . I Peter 3:21 - This water symbolizes baptism that now saves you . . .
37 II. How Would I Know if I Don’t Have This Fellowship? 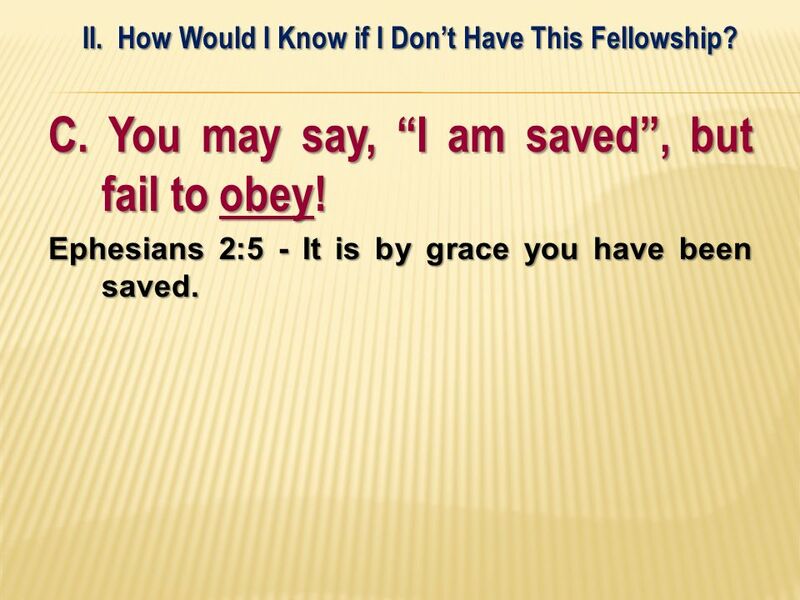 C. You may say, “I am saved”, but fail to obey! Ephesians 2:8 - ﻿ For it is by grace you have been saved, through faith . . . I Peter 3:21 - This water symbolizes baptism that now saves you . . . Romans 5:10 - For if, when we were God’s enemies, we were reconciled to him through the death of his Son, how much more, having been reconciled, shall we be saved through his life! 38 II. How Would I Know if I Don’t Have This Fellowship? 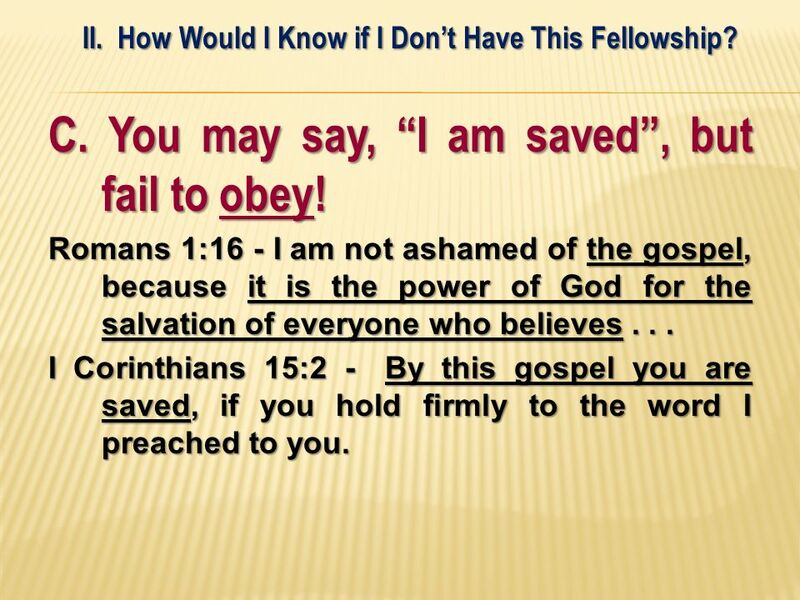 C. You may say, “I am saved”, but fail to obey! Romans 1:16 - I am not ashamed of the gospel, because it is the power of God for the salvation of everyone who believes . . . I Corinthians 15:2 - ﻿ By this gospel you are saved, if you hold firmly to the word I preached to you. 39 II. How Would I Know if I Don’t Have This Fellowship? 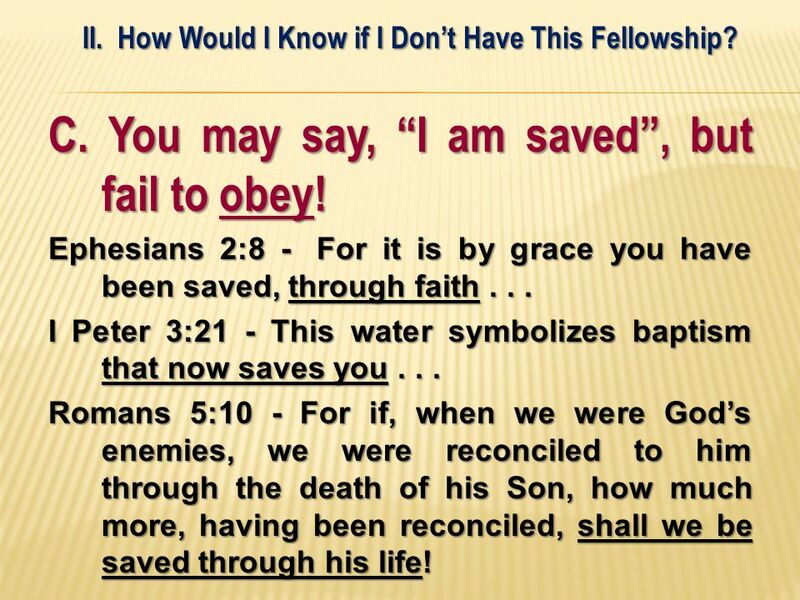 C. You may say, “I am saved”, but fail to obey! Ephesians 2:5 - It is by grace you have been saved. 40 II. How Would I Know if I Don’t Have This Fellowship? 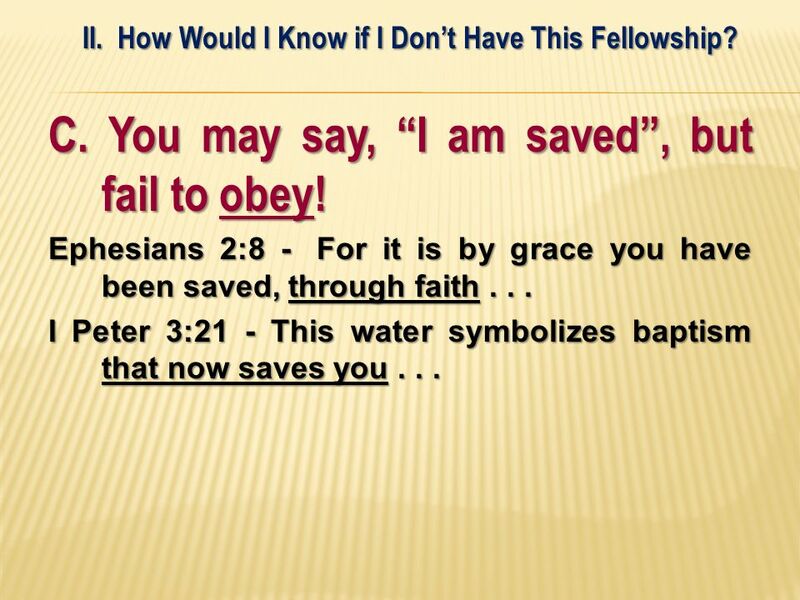 C. You may say, “I am saved”, but fail to obey! Ephesians 2:5 - It is by grace you have been saved. Hebrews 5: once made perfect, he became the source of eternal salvation for all who obey him . . .
41 II. How Would I Know if I Don’t Have This Fellowship? 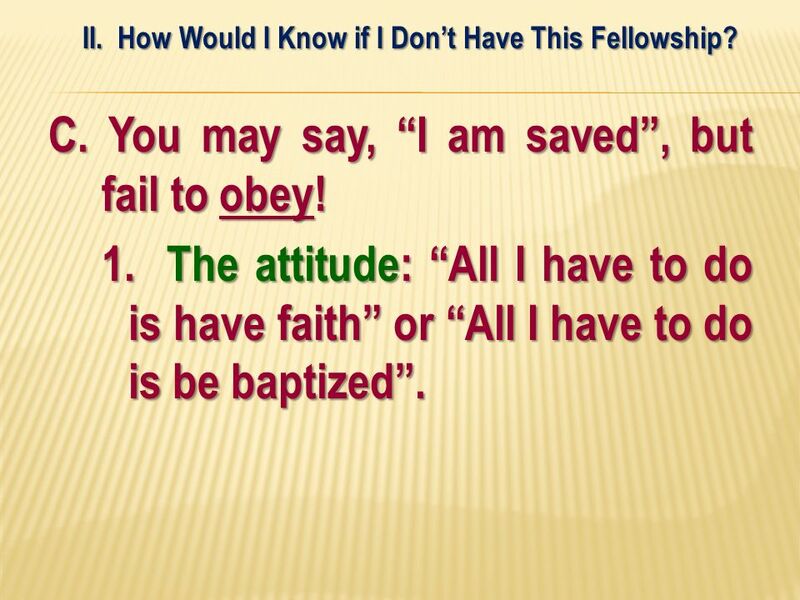 C. You may say, “I am saved”, but fail to obey! Ephesians 2:5 - It is by grace you have been saved. Hebrews 5: once made perfect, he became the source of eternal salvation for all who obey him . . . Romans 8:24 - For in this hope we were saved. 42 II. How Would I Know if I Don’t Have This Fellowship? 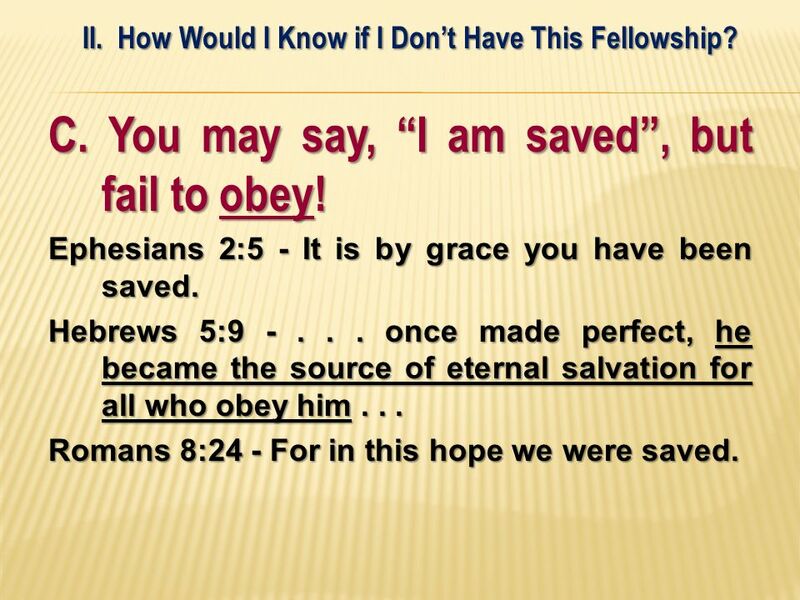 C. You may say, “I am saved”, but fail to obey! Ephesians 2:5 - It is by grace you have been saved. Hebrews 5: once made perfect, he became the source of eternal salvation for all who obey him . . . Romans 8:24 - For in this hope we were saved. James 2: faith by itself, if it is not accompanied by action, is dead. 43 II. How Would I Know if I Don’t Have This Fellowship? 44 II. How Would I Know if I Don’t Have This Fellowship? D. You may not continue growing! Whoever claims to live in him must walk as Jesus did. - 2:6 Romans 12:1 - Therefore, I urge you, brothers, in view of God’s mercy, to offer your bodies as living sacrifices . . .
45 II. How Would I Know if I Don’t Have This Fellowship? D. You may not continue growing! Whoever claims to live in him must walk as Jesus did. - 2:6 Romans 12:1 - Therefore, I urge you, brothers, in view of God’s mercy, to offer your bodies as living sacrifices . . . Matthew 16:24 - If anyone would come after me, he must deny himself and take up his cross and follow me. I. What is Divine Fellowship Anyway? II. How Would I Know if I Don’t Have This Fellowship? III. So - What’s the Remedy? 47 III. So - What’s the Remedy? 48 III. So - What’s the Remedy? A. 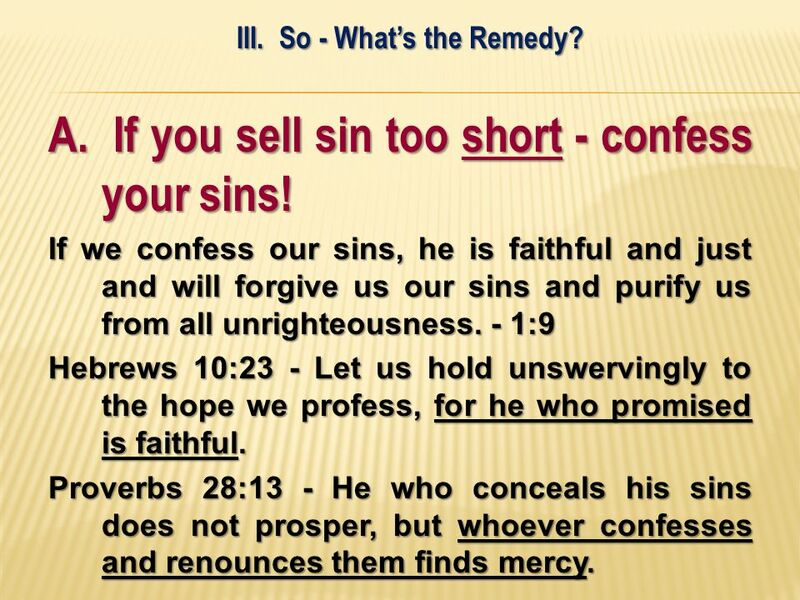 If you sell sin too short - confess your sins! If we confess our sins, he is faithful and just and will forgive us our sins and purify us from all unrighteousness. - 1:9 Hebrews 10:23 - Let us hold unswervingly to the hope we profess, for he who promised is faithful. Proverbs 28:13 - He who conceals his sins does not prosper, but whoever confesses and renounces them finds mercy. 49 III. So - What’s the Remedy? 50 III. So - What’s the Remedy? B. 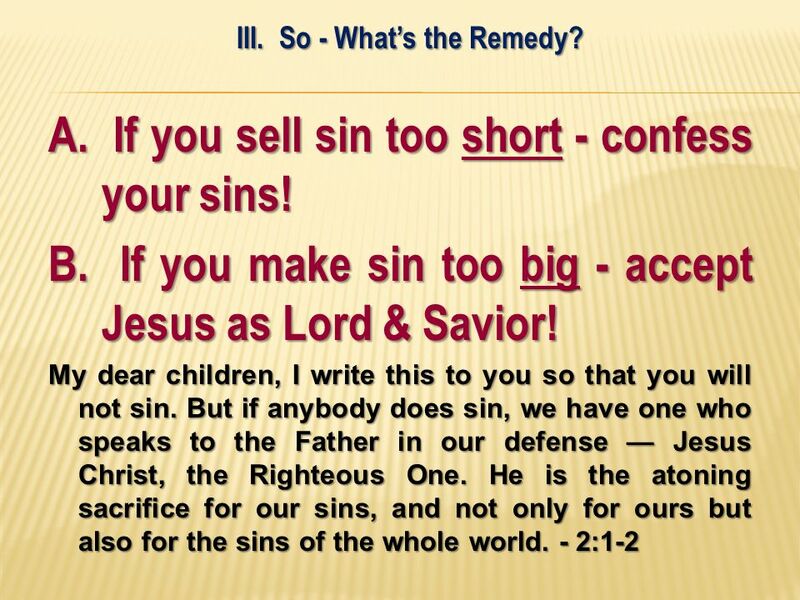 If you make sin too big - accept Jesus as Lord & Savior! My dear children, I write this to you so that you will not sin. But if anybody does sin, we have one who speaks to the Father in our defense — Jesus Christ, the Righteous One. He is the atoning sacrifice for our sins, and not only for ours but also for the sins of the whole world. - 2:1-2 1. 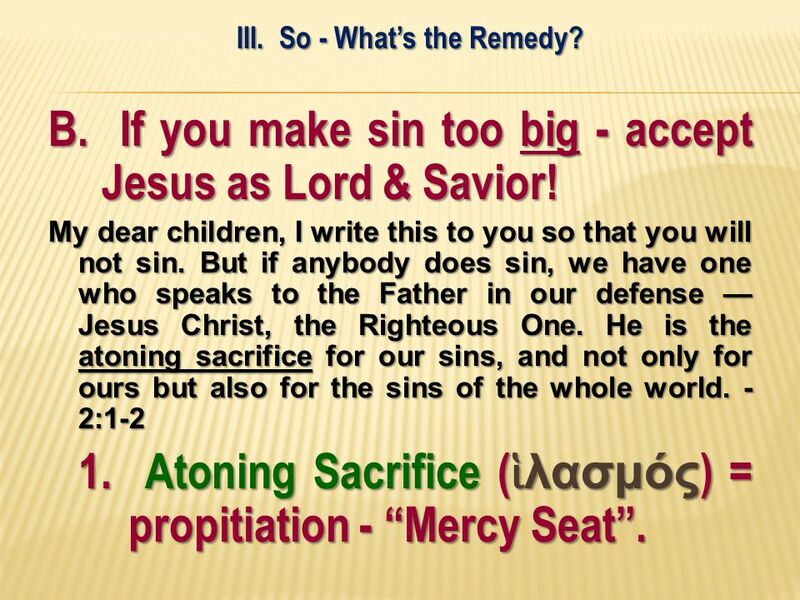 Atoning Sacrifice (ἱλασμός) = propitiation - “Mercy Seat”. 51 III. So - What’s the Remedy? B. 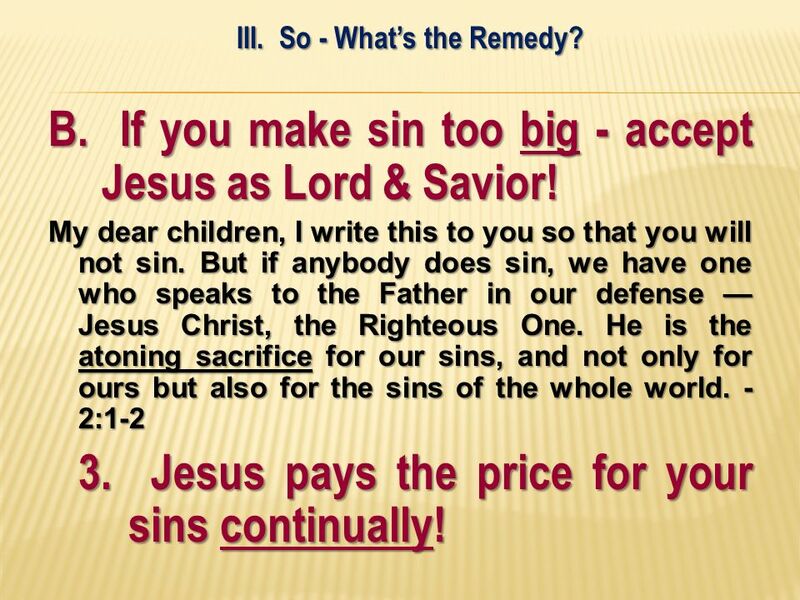 If you make sin too big - accept Jesus as Lord & Savior! My dear children, I write this to you so that you will not sin. But if anybody does sin, we have one who speaks to the Father in our defense — Jesus Christ, the Righteous One. He is the atoning sacrifice for our sins, and not only for ours but also for the sins of the whole world. - 2:1-2 2. 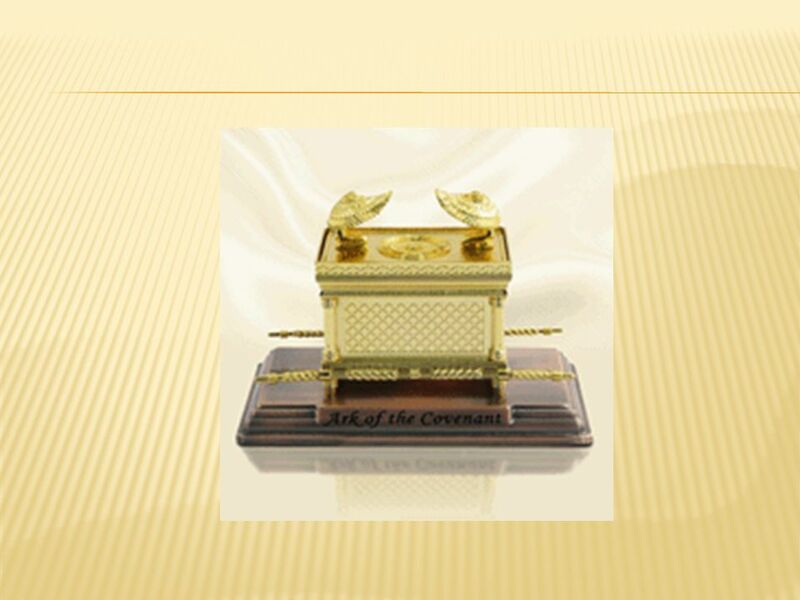 It is the lid of the Ark of the Covenant. 53 III. So - What’s the Remedy? B. 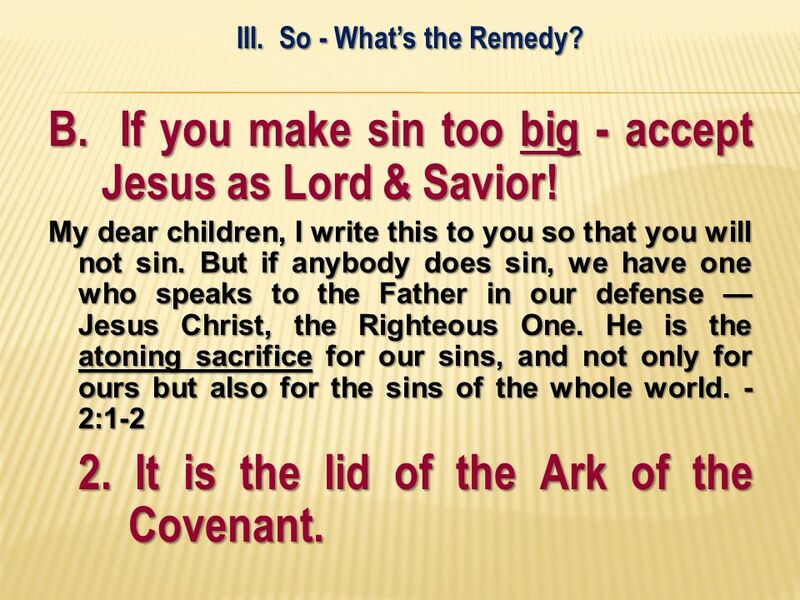 If you make sin too big - accept Jesus as Lord & Savior! My dear children, I write this to you so that you will not sin. But if anybody does sin, we have one who speaks to the Father in our defense — Jesus Christ, the Righteous One. He is the atoning sacrifice for our sins, and not only for ours but also for the sins of the whole world. - 2:1-2 3. Jesus pays the price for your sins continually! 54 III. So - What’s the Remedy? 55 III. So - What’s the Remedy? 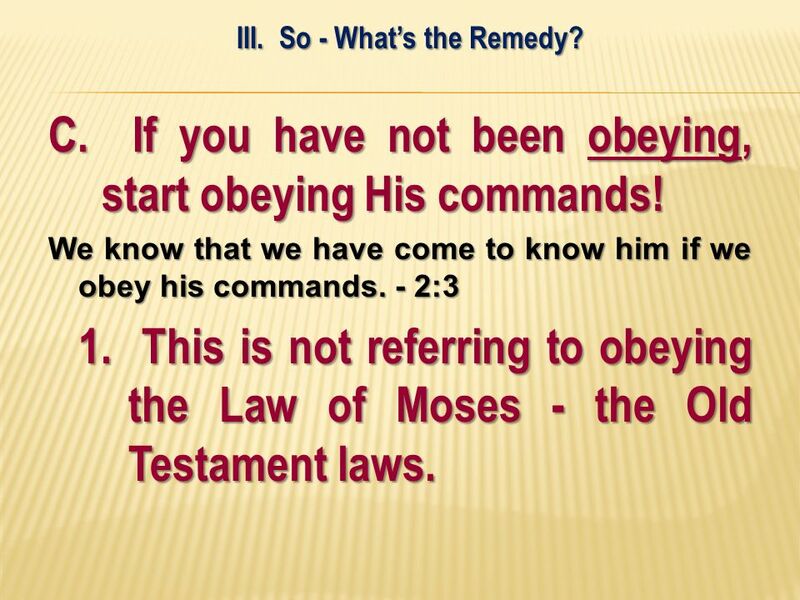 C. If you have not been obeying, start obeying His commands! We know that we have come to know him if we obey his commands. - 2:3 1. This is not referring to obeying the Law of Moses - the Old Testament laws. 56 III. So - What’s the Remedy? 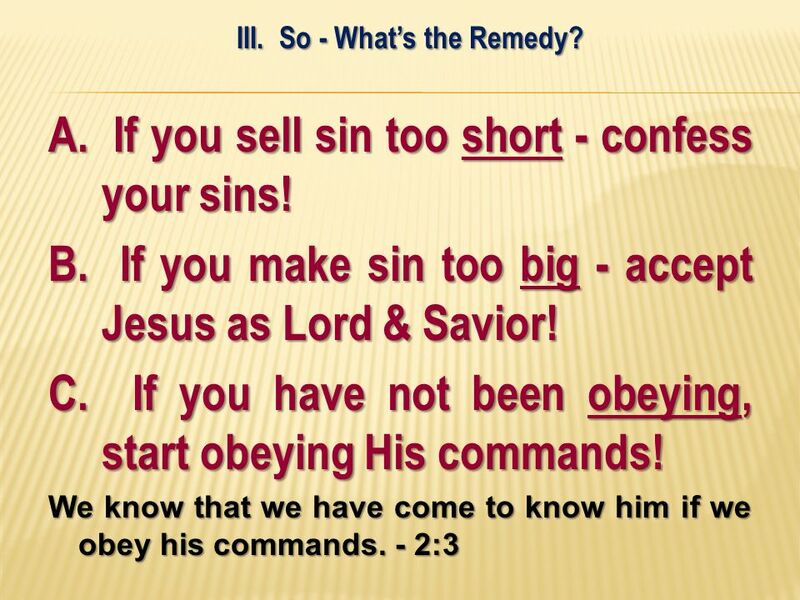 C. If you have not been obeying, start obeying His commands! We know that we have come to know him if we obey his commands. - 2:3 2. 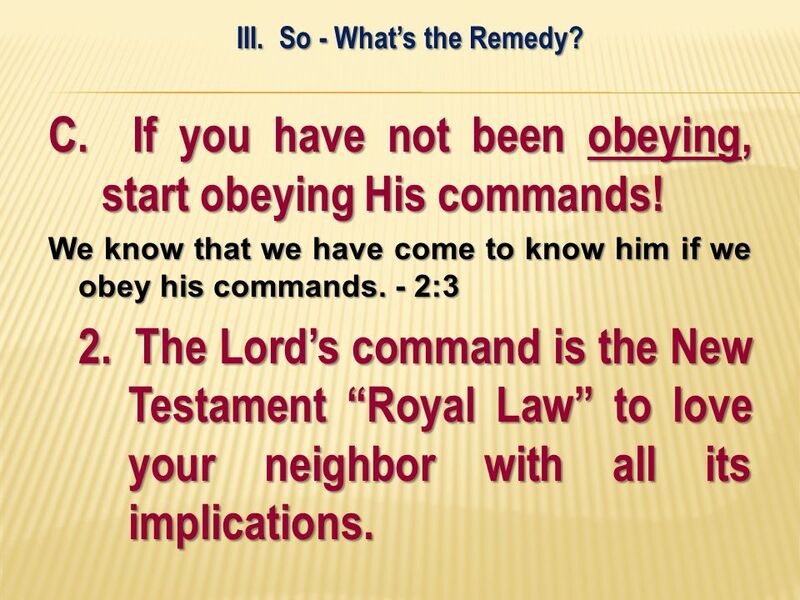 The Lord’s command is the New Testament “Royal Law” to love your neighbor with all its implications. 57 III. So - What’s the Remedy? 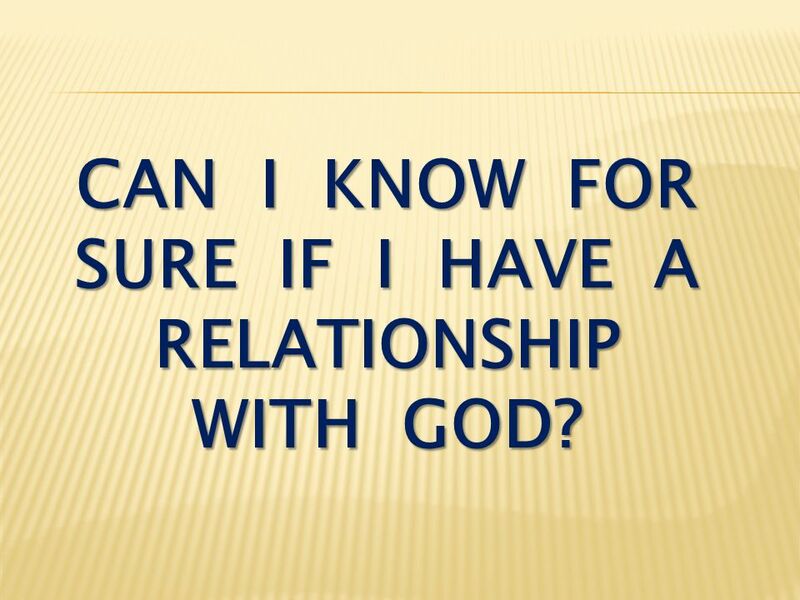 Download ppt "can i know for sure if i have a relationship with god?" 1 John 5: John 5:16-17 “If anyone sees his brother committing a sin not leading to death, he shall ask and God will for him give life to. The Substance of Faith An Evidence and Foundational Christian Curriculum Part 5. God is … Holy; Righteous; Love. He gives us... Freedom; Spirit A gap between us. 2 Corinthians 5:17 Galatians 2:20 John 15:5  2 Corinthians 5:17 Therefore, if anyone is in Christ, he is a new creation; the old has gone, the new has. Romans 1: I am obligated both to Greeks and non-Greeks, both to the wise and the foolish. 15That is why I am so eager to preach the gospel also. Preparing Our Hearts to Reach Out: Giving the Reason 1 Peter 3:13-18.